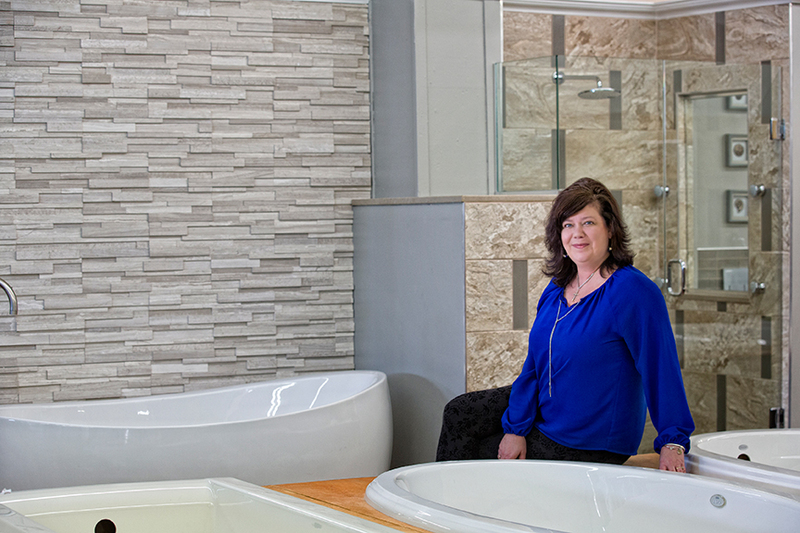 Jennifer Trentadue, designer at Henry Plumbing, talks the best in bathroom design. SLHL: What are the latest trends in bathroom design? Jennifer: No longer are bathrooms strictly utilitarian, but rather a place of luxury and convenience. Custom showers with steam, body sprays and rain heads have taken the place of the Whirlpool bath. Freestanding tubs, heated floors and crazy, fun new tile designs are the latest trends I see. SLHL: What is the best way to maximize space in a small bath? Jennifer: One of the best and simplest ways to maximize space in a small bathroom is to include recessed storage, in the form of niches, medicine cabinets, etc. Recessed storage allows for extra storage without reducing square footage. Tiled niches add flair without overwhelming the space. You even can get them with outlets, TVs or refrigerated storage for medication or skin care…all within your wall! SLHL: What are must-have features in a master bath? Jennifer: A large walk-in shower. The shower is the feature of the space. Design components such as tile design must reflect the homeowner and the theme of the space, making the homeowner’s everyday shower experience the peak of their day. Showers also can be combined with a whirlpool in the same room. This is called a wet room. It creates an area that is a walk-in shower without a door. The tub is then installed in the same room, creating an open feel and great look. SLHL: What do you need to consider when moving plumbing for a master-bath redesign? Jennifer: The main thing to consider when moving plumbing for a master-bath redesign is how it will affect the rest of the home. In some cases, moving the plumbing isn’t too big of a deal. However, some scenarios, such as an upper-level bath redesign, will require construction through the lower levels and up through the ceiling. Another thing to consider when moving plumbing is the wall type in which you want to move to. Different wall types are more suitable for plumbing. I try to avoid moving any plumbing to an exterior wall so that the pipes don’t freeze in the winter. Knowing what is possible and what is not possible is key to making a design successful. SLHL: What is an open-plan bath? Are you seeing more designs like this? Jennifer: The open-plan bath is a design trend that really started in the hotel industry and is now moving into residential spaces. This type of bathroom has little or no separation between the master bedroom and the master bathroom. The idea is to seamlessly transition the rooms into each other and to open the space up and make it feel larger. Like I said earlier, bathrooms are a place of luxury; why hide it? I’ve seen many open-plan bathrooms in hotels, and I have seen the trend begin to take shape in the St. Louis area. It is a great design trend but has a rather specific market. A family with four kids might not find the open plan as useful. Mom might need a door to hide behind sometimes. SLHL: What is the most important feature to include in a guest bathroom? Jennifer: Storage! No one likes to travel somewhere only to have no place to put their Dopp kits and makeup bags with all of their toiletries. Also, easy access to towels and necessities is important.